Ranchers are constantly having to check fence lines to ensure their cattle don’t get the bright idea to investigate the greener grass on the other side. If there is an opening, Cow’s are usually pretty good at finding it and getting through it. We were asked this last week to help locate 4 cattle that were temporarily being kept on a property that had a downed fence in the woods. They managed to get through and off they went. We searched the property to include heavily wooded areas after dark using the drone with a thermal camera to try and locate the cattle. We found no success. The next day, the rancher got a phone call from the local sheriffs department saying his 4 cattle had been spotted a few miles down the road from where they escaped. 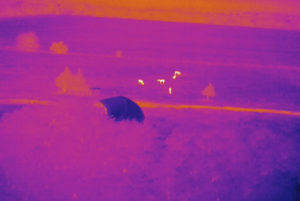 Unfortunately, there were a lot of other cattle on properties near where they were spotted and we could be of no value in determining which of the cattle identified in the thermal images were his. We were able to quickly and efficiently confirm that the cattle were not on or near the property at the time of the search. Even though we did not locate them, the rancher knew they weren’t where they were supposed to be. While on this project, it was pretty cool to see horses and other wildlife in the field. This project was helpful for us as we continue our research on cattle and wildlife surveying with drones. To learn more about how we can help you locate lost cattle or make sure they are all present and accounted for, give us a call at (214) 842-6000!